A Volga Dnepr Antonov AN-124 super transporter has been forced to land at Mumbai airport after it violated Indian airspace under highly suspicious circumstances. As per news reports, the plane was spotted on radar entering Indian airspace around 21:50 local (16:20Z). With no record of the flight and Mumbai having some of the busiest airspace in the country, air traffic control questioned the pilot for details. Any flight over Indian airspace has to obtain an air defence clearance code. The Volga Dnepr flight was unable to provide a correct code which coupled with the vague and evasive responses prompted a high alert. The flight landed at Mumbai’s Chhatrapati Shivaji International Airport at 22:40 (17:10Z). The AN124-100 has been parked on runway 14 which is now closed for operations. Security forces have surrounded the aircraft and are questioning six passengers and two crew. Sources indicate that there is a substantial quantity of arms and ammunition on board. IAF sources said the plane apparently belonging to the United States took off from Diego Garcia island, a military base near Mauritius in the Indian Ocean, and was headed for Kandahar in Afghanistan. I find the claim “belonging to the United States” a little hard to believe. Pictures on TV clearly show the aircraft to be the Antonov AN124-100 belonging to Volga Dnepr airlines which is Russian. In the dark it is impossible to determine the aircraft registration. 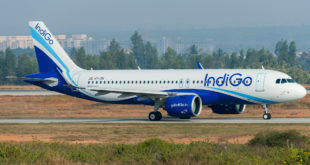 The entire episode caused a total shut-down of the airspace over Mumbai as well as flight operations at Mumbai airport. There is a significant backlog which is now being cleared as operations have resumed. Volga Dnepr is a regular visitor to India and is also involved with defence cargo movements. Recently, it transported Advanced Light Helicopters sold by Hindustan Aeronautics Limited at Bangalore to the Ecuador Air Force. This cannot be a case of ignorance. There are 18 crew on board. All are Russian. The aircraft leased to the US military was transporting US military cargo, primarily vehicles, from the US base at Diego Garcia to the US base at Kandahar in Afghanistan. Initial reports of arms and ammunition have been found untrue. The crew are being questioned by Indian security and civil aviation teams.